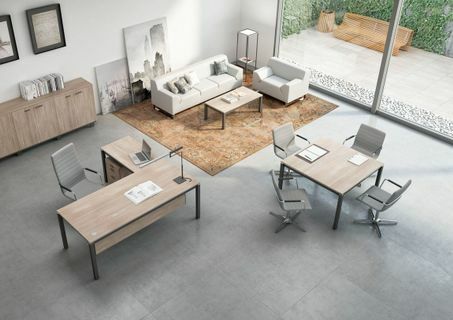 This contemporary office desk design is an ideal solution for businesses seeking a sleek, modern, tailored look and quality components at a price point geared toward staying within budget…especially on larger scale projects. This modern desk design features a durable thermofused laminate worksurface, metal frame and legs and is available in a number of sizes to fit any executive or shared office. It can be configured as a rectangular Table Desk, an L-Shape Desk or an integrated Shared Desk composition with a privacy screen.